MPs of the ruling coalition have officially endorsed a petition seeking a no-confidence vote in vice-president Dr Mohamed Jameel Ahmed. The motion has already gained 47 signatures and will be submitted to the People’s Majlis today, said the parliamentary group leader of the ruling Progressive Party of the Maldives (PPM) Ahmed Nihan. The motion will require a two-third majority or 57 votes to pass. The PPM and its ally the Maldivian Development Alliance (MDA) control 48 seats in the 85-member house, and will need the backing of the opposition. Jameel was not responding to calls at the time of going to press. He is reportedly abroad. The President’s Office on Thursday said President Abdulla Yameen had authorized a medical leave for his deputy. Ruling coalition MPs have publicly accused Jameel of incompetence and disloyalty. Some opposition politicians have claimed President Yameen is fatally ill and wants a more loyal deputy ahead of a life-threatening surgery. 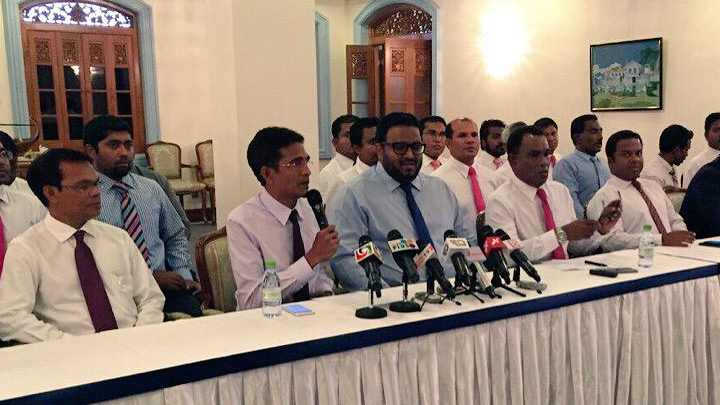 The PPM is seeking to replace Jameel with tourism minister Ahmed Adeeb. He said MPs are unhappy with Jameel over his alleged failure to defend the government during an opposition demonstration in Malé on May 1. Nearly 200 people were arrested from the historic 20,000-strong march. “The opposition was making gross accusations against the government. But Jameel did not make any move to defend President Yameen, he did not say a word, but instead left Malé on that day,” Nihan alleged. Opposition supporters had been protesting against the imprisonment of ex-president Mohamed Nasheed and other politicians. Nihan said that he had attempted to reach Jameel by telephone on Thursday night, when a ruling party MP first started collecting signatures for the no-confidence petition. But the vice-president had not responded by the next day, he said. MPs of the ruling coalition held a meeting at 10:30pm on Friday to officially endorse the petition. Some 33 MPs had unanimously voted in favor, he said. For the parliament to consider the removal of the president or the vice-president, a resolution with the signatures of one-third of MPs is required. The parliament can then set up a committee to investigate the claims laid out in the motion. The Constitution states that at least 14 days notice must be given to the president or vice-president before the debate. He or she is also granted the right to defend themselves, both orally or in writing. Jameel has been silent on the accusations made against him. According to Nihan, the 47 signatures on the no-confidence petition include that of MPs of the opposition Maldivian Democratic Party (MDP) and the Jumhooree Party. The opposition’s backing appears to signal a move towards reconciliation. Former president Nasheed was transferred to house arrest last week. Two days later, the opposition voted to back the first constitutional amendment, setting new age limits of 30 to 65 years for the presidency and the vice-presidency. Tourism minister Adeeb, who turned 33 in April, was ineligible for the position as the constitution previously stated that presidential candidates and their deputies must be 35 years of age. The government then extended Nasheed’s house arrest for eight weeks, but said it was because doctors are concerned over the opposition leader’s health. The MDP has meanwhile agreed to the government’s demand to exclude Nasheed as a representative in talks. But a party spokesperson said MDP hopes Nasheed will be able to join at a later stage. Parliament today approved President Abdulla Yameen’s nominees for a vacant seat on the Elections Commission (EC) and the new ambassador to Pakistan. Former Human Rights Commission of Maldives President Ahmed Saleem was approved as the ambassador to Pakistan whilst Ahmed Akram was appointed to the EC. Saleem had also served at the foreign ministry, the Maldives High Commission in Sri Lanka, and the Maldives’ permanent mission to the UN in New York. Both nominees were approved unanimously with 53 votes in favour. Opposition MPs did not participate in the vote. Akram was previously the deputy secretary-general of the Maldivian Democratic Party (MDP) and is reportedly related to the wife of the party’s former chairperson, MP ‘Reeko’ Moosa Manik, who was expelled from the party last year. Akram also quit the party last year. President Yameen nominated Akram to the EC after the five-year term of a previous member expired in November. Today’s sitting also proceeded amidst continuing protests on the People’s Majlis floor by opposition MDP MPs over the conviction of former President Mohamed Nasheed. Preliminary debate on an amendment submitted to the constitution by government-aligned Maldives Development Alliance MP Ahmed Amir as well as voting on the president’s nominees took place amidst the opposition MPs’ protest. Opposition MPs used whistles and megaphones to call for the release of the opposition leader. Amir’s amendment meanwhile – which would require a three-quarters majority of the 85-member house to be passed – proposed removing clauses b) and c) from Article 231 of the Constitution. The clauses stipulate that local councils shall be elected for a three-year term and that chairs and deputy chairs shall be elected through secret ballot by councillors. The MP for Dhaal Kudahuvadhoo proposed specifying both the terms and process of electing chairs and deputy chairs in the Decentralisation Act. The Maldives Development Alliance (MDA) has proposed the first amendment to the constitution, seeking to bar individuals aged 65 years and above from standing for the presidency. Hoarafushi MP Mohamed Ismail told Minivan News he had submitted the amendment to Article 109 of the Constitution because he believed an elected president must “suitably represent” the country’s predominantly young population. “We do not want a President who cannot function due to old age and has to be brought to important meetings in a wheelchair. The President should not be over the age of sixty-five,” he said. According to the Department of National Planning, half of the Maldivian population is under 25 years of age. If passed, the amendments would bar Jumhooree Party (JP) leader Gasim Ibrahim and former President Maumoon Abdul Gayyoom from contesting the 2018 presidential elections. Gasim would be 66 years and Maumoon would be 81 by 2018. The JP has today announced it will reject the amendment with JP’s deputy parliamentary group leader Abdulla Riyaz stating the JP would lobby all parties to vote against the proposal. “We do not believe in using the youth as an excuse to do these kinds of acts for political gain. It is irresponsible,” Riyaz told local media. The proposal would require a two-third majority of the full 85-member house or 57 votes to pass. The ruling coalition i.e. the Progressive Party of the Maldives (PPM) and MDA currently hold 48 seats at the parliament. JP holds 13 seats while opposition Maldivian Democratic Party (MDP) holds 22. He also pointed out that Article 26 (b) on fundamental rights and freedoms states that ‘every citizen of Maldives eighteen years of age or older has the right to run for public office’. Sameer and former Attorney General Husnu Suood claim that a public referendum would be required before the President could ratify the amendment. Sameer pointed to Article 262 (b) of the Constitution which states that any amendments made by the People’s Majlis to certain provisions – including Article 108 which governs presidential elections – can only be ratified by the President after a public referendum. “Amendments to the constitution are usually brought after the constitution has been tested by time and when such amendments become necessary to the people of the nation, not for the gain of the government at the time or certain individuals,” said the MP. Minivan news was unable to reach PPM at the time of press. 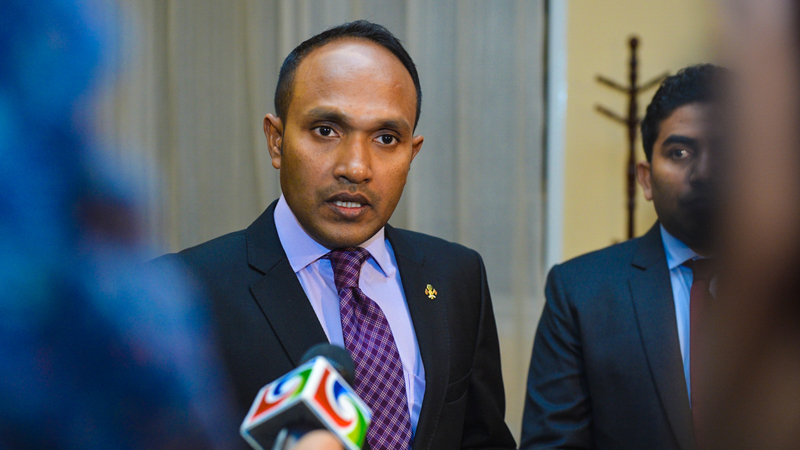 The People’s Majlis has today approved Criminal Court Judge Muhthaz Muhsin for the post of prosecutor general (PG). Muhsin’s nomination for the role – vacant since November – received 62 votes in favour, and seven votes against, while 12 MPs abstained. 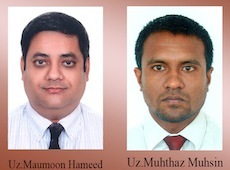 President Abdulla Yameen had nominated Muhsin and his nephew Maumoon Hameed for parliamentary approval on June 2. As Muhsin’s name was put to a vote first and approved, Speaker Abdulla Maseeh Mohamed did not call a vote for Hameed. Thirteen MPs of the opposition Maldivian Democratic Party (MDP) also voted in favour of Muhsin. They were Addu Meedhoo MP Rozaina Adam, Felidhoo MP Ahmed Marzooq, Hithadhoo South MP Ali Nizar, mid-Hithadhoo MP Ibrahim Mohamed Didi, Hulhuhenveiru MP ‘Reeko’ Moosa Manik, Komandoo MP Ahmed Nashid, Kulhudhufushi North MP Abdul Gafoor Moosa, Kurendhoo MP Abdul Bari Abdulla, Addu Maradhoo MP Ibrahim Shareef, mid-Henveiru MP Ali Azim, Mulaku MP Ibrahim Naseer, Vaikaradhoo MP Mohamed Nazim, and Velidhoo MP Abdulla Yameen. While the Jumhooree Party (JP) decided today that its 12 MPs would abstain in the vote, JP MP for Kendhoo Ali Hussain voted in favour of Muhsin. MDP MP for Alifushi, Mohamed Rasheed Hussain ‘Bigey’, joined the remaining 11 JP MPs in abstaining while all seven MPs who voted against Muhsin belonged to the opposition MDP. The MDP parliamentary group had reportedly decided last night to issue a three-line whip against Hameed and to give its 23 MPs a free whip to vote as they chose for Muhsin. With 20 MPs in attendance at parliamentary group meeting last night, the proposal by Deputy Speaker Moosa Manik was passed with 13 votes in favour. Meanwhile, at a parliamentary group meeting on Saturday (July 19), MPs of the Progressive Party of Maldives (PPM) decided to endorse Muhsin despite the party’s leader, former President Maumoon Abdul Gayoom, urging ruling party MPs to vote for his nephew Maumoon Hameed. Majority Leader MP Ahmed Nihan confirmed to Minivan News that a three-line whip was also issued for PPM MPs to vote for Muhsin. All PPM MPs in attendance along with MPs of coalition partner Maldives Development Alliance (MDA) voted in favour of approving Muhsin as the new PG. Maumoon Hameed has meanwhile criticised the PPM MPs’ decision on his Facebook page. “The reasoning behind the decision of the PPM parliamentary group this afternoon apparently went something like this: ‘He won’t do as he’s told! '” he wrote. Responding to the post, former MP Mohamed ‘Colonel’ Nasheed alleged that PPM MPs on the independent institutions oversight committee were instructed to award zero percent to Hameed and 100 percent to Muhsin during the vetting process. Following evaluation of the nominees at a closed session based on academic qualifications, experience, and competence, the oversight committee awarded Hameed 33 percent and Muhsin 67 percent and decided against recommending either nominee for approval. In a letter to PPM Parliamentary Group Leader Nihan demanding an explanation of the PPM-majority committee’s decision, Gayoom had contended that the committee meeting where the nominees were interviewed was conducted in violation of parliamentary rules. Rozaina also alleged that Yameen had conspired for the previous parliament to reject Maumoon Hameed in April by ensuring that several PPM MPs would be absent for the vote. Several pro-government MPs – including Nihan who was with President Yameen in Japan and MDA Leader Ahmed Siyam – were conspicuously absent at the sitting, which saw Hameed fail to garner the required 39 votes after falling just three votes short. Following the previous parliament’s rejection of Hameed, President Yameen refused to submit a new nominee and opened up a third call for applicants, announcing his intention to nominate Hameed for a second time to the newly elected 18th People’s Majlis. The PG’s post has been vacant since November 25 following the resignation of Ahmed Muiz ahead of a scheduled no-confidence motion in parliament. Meanwhile, Acting PG Hussein Shameem’s resignation in early May brought the criminal justice system to a halt after state prosecutors went on strike, citing concerns of a lack of accountability in the absence of a PG. However, the Supreme Court ordered prosecutors to resume work “without any further excuse” and ordered the seniormost official at the PG office to assume the PG’s responsibilities. Parliament’s independent institutions oversight committee last night decided against recommending for approval President Abdulla Yameen’s nominees for the vacant post of Prosecutor General (PG). According to opposition Maldivian Democratic Party (MDP) MP Rozaina Adam, the committee awarded President Yameen’s nephew Maumoon Hameed 33 percent and Criminal Court Judge Muhthaz Muhsin 67 percent following a vetting process. A minimum score of 75 percent or marks is required for the committee to recommend a nominee for approval. The pair were interviewed by the committee last Thursday night (July 10). Marks were awarded following evaluation of their academic qualifications, experience, competency, management skills, leadership qualities, achievements, and integrity. The nominees will however be put to a vote on the People’s Majlis floor. The ruling Progressive Party of Maldives (PPM) has a clear majority of the 85-member house with 43 MPs in addition to five MPs of coalition partner Maldives Development Alliance (MDA). The independent institutions oversight committee is comprised of five PPM MPs, one MDA MP, three MDP MPs and two Jumhooree Party (JP) MPs. The final evaluation process took place at a closed session last night where opposition MPs reportedly awarded zero marks to both nominees. In April, Maumoon Hameed failed to garner the required 39 votes in the previous parliament – falling just three votes short – four months after he was put forward by President Yameen. The independent oversight committee in the 17th People’s Majlis had also rejected Hameed’s nomination after the lawyer failed to meet the assessment criteria. “Approval is based on a preset grading scheme, and not on members’ opinions,” MP Rozaina told Minivan News at the time. The PG’s post has been vacant since November following the resignation of Ahmed Muizz ahead of a scheduled no-confidence motion in parliament. Moreover, Acting PG Hussein Shameem’s resignation in early May brought the criminal justice system to a halt after state prosecutors went on strike, citing concerns of a lack of accountability in the absence of a PG. President Yameen meanwhile refused to submit a new nominee to the 17th Majlis during the crisis and opened up a third call for applicants, announcing his intention to nominate Hameed – son of former Atolls Minister Abdulla Hameed – for a second time to the newly elected 18th People’s Majlis. Meanwhile, at its meeting last night, the independent institutions committee also awarded 68 percent to President Yameen’s nominee for the Police Integrity Commission, Adam ‘Kurolhi’ Zahir. The committee however approved the nominations of former MP Abdul Azeez Jamal Abubakur for the newly created post of Information Commissioner with 88 percent and Aishath Zahira for deputy governor of the Maldives Monetary Authority (MMA) with 90 percent. A five-member select committee tasked with constituting parliament’s standing committees has finalised the composition of the 13 committees after political parties reached a compromise today. Following weeks of disagreement, a proposal by opposition Maldivian Democratic Party (MDP) MP Ibrahim Shareef – seconded by MP Ahmed Amir from the government-aligned Maldives Development Alliance (MDA) – was passed with three votes in favour at the 12th meeting of the select committee. In addition to Shareef and Amir, the select committee included MP Riyaz Rasheed as the chair from the ruling Progressive Party of Maldives (PPM), MP Gasim Ibrahim from the Jumhooree Party (JP), and MP Anara Naeem from the Adhaalath Party (AP). JP Leader Gasim Ibrahim did not participate in the vote after objecting to a change in the number of seats in some committees. The committee decided to increase the number of seats in the public accounts oversight committee to 13 and reduce the number of seats in the petition committee and ethics committee to 10. A proposal by MDA MP Amir to constitute the ‘241’ security services committee with 14 seats was also approved with six seats for the PPM, three seats for the MDP, two seats for the JP, one seat each for the MDA and AP, and one seat for Independent MP Muaz Mohamed Rasheed. Aside from the 241 committee, Muaz – the sole remaining independent – was assigned to the ethics committee. Reflecting the ruling coalition’s majority with its 46 MPs in the 85-member parliament, the PPM-MDA secured a voting majority on all standing committees with the exception of the privileges committee. Parliamentary rules dictate proportional representation on the standing committees based on the number of MPs in each party. Concluding the select committee meeting today, Chair Riyaz Rasheed said the committee’s report will be submitted to the Majlis floor, where it would be put to a vote. The PPM MP for Thaa Vilifushi expressed gratitude to political parties for agreeing to compromise. Two consecutive sittings had been called off amid disorder in the chamber after MDP MPs insisted that preliminary debate on bills could not begin in the absence of standing committees to review legislation. Speaker Abdulla Maseeh Mohamed adjourned yesterday’s sitting to hold discussions with political party leaders. At last week’s sitting, pro-government MPs had accused the opposition of obstructing the Majlis to thwart the government’s legislative agenda, while MDP MPs accused the ruling coalition of attempting to create “a one-party state” without parliamentary oversight. Today’s sitting was meanwhile adjourned to allow the select committee to conclude its work. Speaker Maseeh has since announced that the next sitting will take place at 10:30am on Monday (June 30). The first piece of legislation up for debate is the bill on establishing special economic zones, the centrepiece of the government’s legislative agenda. Public Accounts Committee – six seats for PPM, four seats for MDP, two seats for JP, and one seat for MDA. Government Oversight Committee – five seats for PPM, three seats for MDP, two seats for JP, and one seat for MDA. Independent Institutions Committee – five seats for PPM, three seats for MDP, two seats for JP, and one seat for MDA. ‘241’ Security Services Committee – six seats for PPM, three seats for MDP, two seats for JP, one seat for MDA, one seat for AP, and one seat for the Independent MP. National Security Committee – five seats for PPM, three seats for MDP, two seats for JP, and one seat for MDA. Social Affairs Committee – five seats for PPM, three seats for MDP, two seats for JP, and one seat for AP. Economic Affairs Committee – five seats for PPM, three seats for MDP, two seats for JP, and one seat for MDA. National Development Committee – five seats for PPM, three seats for MDP, one seat for JP, one seat for MDA, and one seat for AP. Rules Committee – six seats for PPM, three seats for MDP, one seat for JP, and one seat for MDA. Ethics Committee – five seats for PPM, three seats for MDP, one seat for JP, and one seat for the Independent MP. General Affairs Committee – five seats for PPM, three seats for MDP, two seats for JP, and one seat for MDA.